There have been several valleys in the cinematic saga of Leatherface and the Sawyer family since Tobe Hooper’s seminal 1974 horror film The Texas Chain Saw Massacre and 1986’s delightfully weird sequel. Texas Chainsaw 3D is a crater; a new low in the series, looking to shamelessly capitalize on the name of the original film with no cares about sullying it legacy. Director John Luessenhop and the three credited writers don’t seem to care one bit about continuity or coherence, eager to get to through their generic horror tropes and build to one of the lamest genre twists we’ve had the displeasure to witness. The movie picks up outside of the Sawyer family farmhouse, right where the original left off. Sort of. Following the murder of several teens and the escape of Sally (recounted during the opening credits for the uninitiated), family spokesman Drayton (Bill Moseley) is holed up with grandpa and Leatherface. Suddenly, though, there are a dozen or so family members at the home; they’re more of the general redneck ilk rather than the singularly strange killers we know. Out for vigilante justice, the townsfolk of Newt, Texas burn the home to the ground despite the protests of Sherriff Hooper (Thom Barry). A Sawyer infant survives the ordeal and is taken in by a bickering couple. Fast-forward 40 years to 2013 and that infant is now 20-something (yes, that’s correct) supermarket butcher Heather (Alexandra Daddario). Unaware of her family history, Heather gets word that her “real” grandmother has died in Newt and she’s inherited her estate. With boyfriend Ryan (Trey Songz), best pal Nikki (Tania Raymonde), and some dude named Kenny (Keram Malicki-Sánchez), Heather heads to Newt to claim her inheritance, the crew picking up a hitchhiker (Shaun Sipos) along the way. 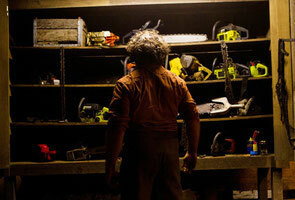 A shocking discovery is made in the basement of the beautiful antebellum home: Leatherface. The now would-be geriatric psychopath picks up his trusty chainsaw in to slice through the intruders. Mayor Burt (Paul Rae) learns of the killer’s resurfacing and sets out to silence him once and for all, while Heather learns of her familial history. Let’s pretend for a minute that we can look past the gross timeline errors and accept the fact that a 40-year-old woman is trapped inside the midriff-bearing body of Daddario; and that an elderly Leatherface can still run and wield a huge chainsaw after being locked in a dank basement for four decades. It’s hard, but let’s humor Luessenhop and the writing team who overlooked, or more likely didn’t care, about this issue. What we’re left with is just a completely inept horror knockoff. In addition to the direct (loose) connections with the original, we get kids on a road trip in a van that pick up a hitchhiker. We get the creepy flashbulb sound effect – when and where I don’t really remember, but it doesn’t matter. The Sheriff is named for Tobe Hooper, unless that’s just a coincidence the inept production didn’t realize. Potential victims are prototypical morons, getting themselves trapped in confined spaces and going to investigate strange noises or occurrences. There’s a big swerve midway through the film that involves the mayor, Leatherface, and Heather that is foreshadowed but completely idiotic. I will not spoil it, but it’s a half-baked paradigm shift masquerading as subversion without a hint of irony. It will leave you yearning for a return to the generic formula that marked the first half of the dismal picture. Terrible acting, uninspired writing, and flat direction predictably come together to create a truly painful experience. The schlocky prospects of Leatherface’s chainsaw popping out of the screen in 3D are dimmed (quite literally) with grainy effects and completely unimaginative use of the third dimension. This movie is the worst of the Chainsaw series, which is saying a lot.